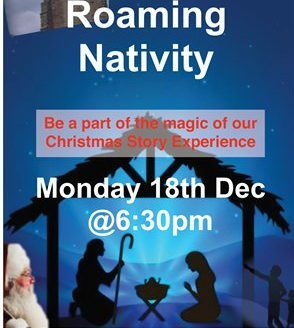 Monday 18th December starting at 6:30pm onwards, at Churchfield House is our Christmas Story Experience. Meet Father Christmas at Churchfield House then get sent away with a storyteller. You’ll arrive outside the Church’s front door where a grumpy innkeeper will send you away to a stable scene in memorial park with live animals (which you can pet). Then, led by your storyteller, come back towards church and see the star brightly shining, go in to Mary and Joseph’s house and see a real baby Jesus, Mary, Joseph and three kings from afar! Follow on through their house into St Batholomew’s Church, sing some carols, hear how the story continues, with mince pies, mulled wine, biscuits and squash. Finishing with a Christmas blessing. This is a truly festive event telling the story in a exciting and interactive way, not to be missed. Children are the responsibility of their parents/carers throughout the entire event, and as it is an outdoor event, appropriate clothing and a torch is strongly recommended.